Another shot from yesterdays visit to Sculpture on the edge. 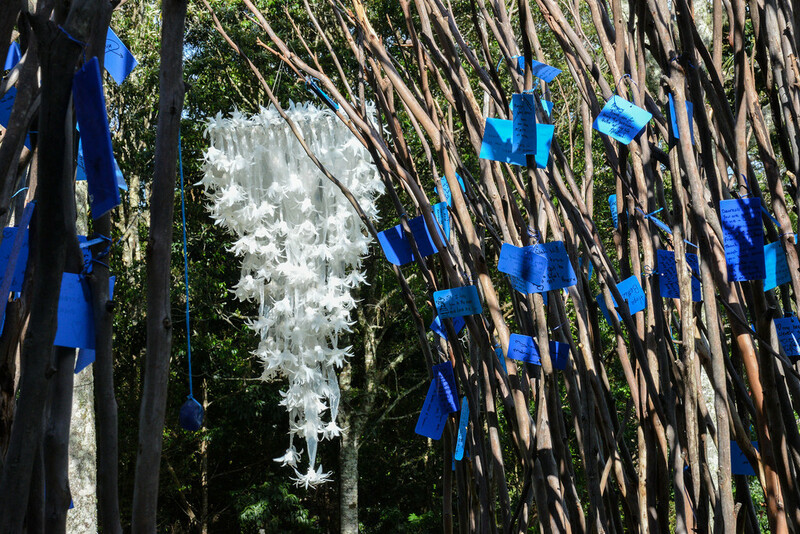 The winning work, 'Love Birds' by Miles Alan, was an arbor of sticks with blue tags (relating to bower birds passion for blue) on which the public could add 'love notes'. The white hanging work came second. It is called 'The point is" and was made by Yanni VanZiel from plastic milk bottles. I didn't know it was on...so thanks for posting this image with enough time for me to wiz up there and see it. Love your pic of it!! Great photo and story. Our "love notes" to bower birds were nick nacks of blue left outside for them to find; bottle tops, pegs, bread bag fasteners. It was fun to find things in the bower later on. @hrs It is a nice exhibition and the grounds are lovely - it is at Spicers Tamarind resort - the Maleny one on Obi Lane South (I think) - anyway, the road to Gardners Falls. If you are going through Mapleton, you are most welcome to drop in.